Megan has been in financial services for 10 years beginning her work experience as a Sunflower Bank branch teller while attending college. 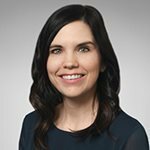 After graduation from Kansas State University with a dual degree in Business Administration and Human Resources Management, Megan has specialized in Wealth Management and Trust Administration at a national advisory firm and regional banks. At Sunflower Bank Wealth Management, Megan enjoys being a part of a team effort to provide the best solutions and customer service to clients locally and beyond. Just listen – people tend to open up and trust you more when you listen to them no matter what the circumstance is. By listening, you develop a relationship with your client that becomes more beneficial to each of you. Focus on my clients – listen to their needs and wants while helping find solutions that best fit their situation. I want my clients to feel comfortable with me, to feel like they are able to come to me with all financial needs and most importantly, that they understand I care about them and what is going on in their lives. I strive to develop a long-term relationship with each client and help them determine their retirement goals and needs.